DENVER, March 26, 2019 /PRNewswire/ — Spectralink, a leader in enterprise mobile solutions, and Jeron Electronic Systems, Inc., a leader in Nurse Call communications, today announced the certification of Jeron’s voice communications and Noti-Fi alerting application with the Spectralink Versity enterprise Smartphone for alerts and private communications between caregivers and their patients. Seamless, workflow-driven communications powered by this joint solution ensure rapid response and care team collaboration, while empowering caregivers to deliver more personalized, focused care for their patients throughout the day. 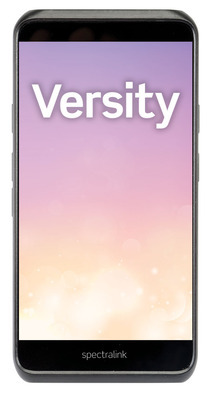 Purpose built for the rigors and requirements of today’s healthcare workflows and working environments, the Versity smartphone delivers enterprise-grade performance, superior voice quality and proven reliability in a durable, slim, lightweight design that is easy to carry and use. Jeron’s SIP voice integration and Noti-Fi Application augment these capabilities with ready access to real-time data that helps clinicians enhance patient care, improve clinical collaboration and drive better outcomes. Deployed through Versity’s open Android platform, Provider® 790 keeps staff mobile while completely connected to their patients and team members for streamlined workflows and direct communications. The successful partnership and joint solution offering of Spectralink and Jeron is just one of many successes made possible through Spectralink’s Application Integration and Management Solutions (AIMS). Established in 2014, the AIMS program provides a collaborative environment for partners and Spectralink to work together to integrate and enrich solutions for enterprise customers in key industries such as healthcare. To learn more about this joint solution and the Spectralink AIMS partner program, visit www.spectralink.com. A leader in communications systems for the healthcare and life safety industries, Jeron Electronic Systems, Inc. is the engineering and manufacturing force behind Provider Nurse Call and Pro-Alert Area of Rescue Systems. These systems facilitate communications, help speed response times and integrate with a wide spectrum of alerting and notification technologies, all focused on delivering the highest levels of safety. From its founding in 1965, Jeron has earned a solid reputation for innovation, quality and service. Jeron products are engineered and manufactured in the USA. For more information please visit, www.jeron.com. Spectralink leads the enterprise mobility market with industry’s most deployed mobility solution portfolio optimized for mission-critical healthcare, retail, manufacturing and hospitality applications. As the enterprises transition to mobile workflows, Spectralink is at the forefront of the industry transformation through its innovative end-to-end mobility portfolio. Designed for challenging RF environments, our mobile solutions enable enterprises to streamline their workflows and deliver a positive customer experience. To protect our customers’ investments in UC platforms, we offer the best interoperability in the industry with the leading call control platforms. Since 1990, Spectralink has deployed millions of mobile devices worldwide – providing enterprises with the industry’s most reliable, high quality and secure mobility solutions. For more information, please visit www.spectralink.com.